Henslow's Balsam is a woody shrub up to 1.5 m high. It is named for John Stevens Henslow (1796-1861), a British priest, botanist and geologist. He is best remembered as friend and mentor to his pupil Charles Darwin. Flowers are borne in leaf-axils, solitary or in fascicles, white. Flower-stalks are slender, 3-10 cm long, hairless or hairy. Lateral sepals are ovate, tapering. Lip is boat-shaped; spur 4.5-6 cm long, slender, incurved, velvet-hairy up to middle. Standard is nearly round, notched with an erect spur on back. Wings 2-lobed. Stems are simple or branched, fleshy when young, covered with scars of fallen leaves. Leaves are alternate or spiral, elliptic-lanceshaped, sawtoothed, 3.5-4 x 1.2-5 cm, nearly hairless to hairy; glandular along margins. Leaf-stalks are 0.8-5 cm long, becoming hairless to hairy. Capsules are spindle-shaped, 2-2.5 cm long, hairless or hairy; seeds almond-shaped, about 3 mm long, rusty-brown, furrowed. 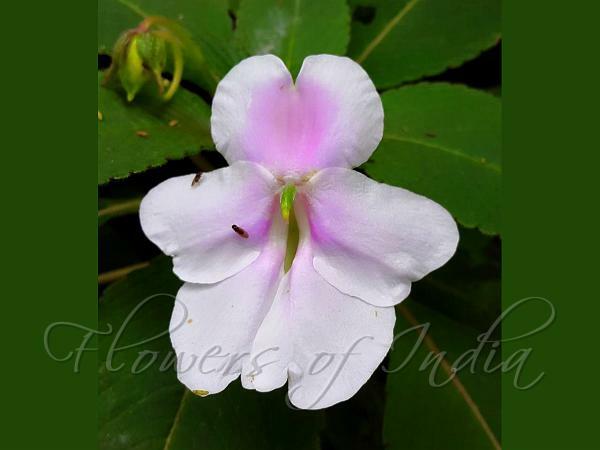 Henslow's Balsam is found in Southern W. Ghats in ravines and clefts of rocks, 600 - 2000 m, in Tamil Nadu, Kerala and Sri Lanka. Flowering: April-Oct.